"We had President Trump say the election should be about him, even though he's not on the ballot and, in Maryland, that's exactly what happened"
A day after Maryland Gov. Larry Hogan won re-election, he spoke about "finding a way to work with people, regardless of their party affiliation." His top priorities will be to draft a budget and develop legislative priorities. News4's Chris Gordon reports. Fresh from a historic re-election victory, Gov. Larry Hogan said Wednesday the losses of other Maryland Republicans on Election Day were "a repudiation" of President Donald Trump. Hogan said his large win against Democrat Ben Jealous in a state where Democrats outnumber Republicans 2-1 was the result of his moderate political course and voters' desire for bipartisanship and civility. He won about 56 percent of the vote to become the first Republican governor to be re-elected in Maryland since 1954. 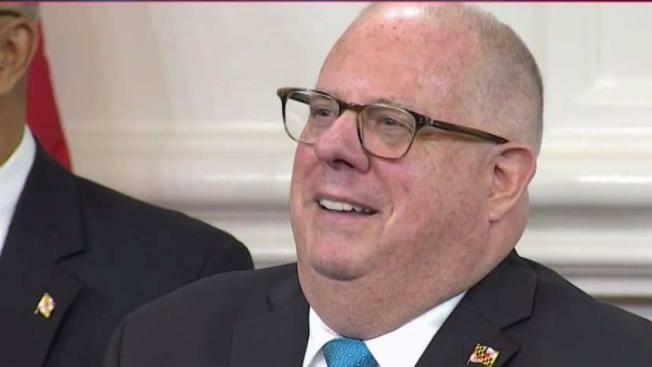 "We had President Trump say the election should be about him, even though he's not on the ballot and, in Maryland, that's exactly what happened," Hogan said. "It was a repudiation of the president who lost this state by 30 points, and people came out and expressed their frustration against just about all Republicans in our state with the exception of us." Republicans were hoping the governor would have coattails to enable the GOP to win enough seats in the Maryland Senate to end a supermajority held by Democrats that enables them to override Hogan's vetoes. However, for the most part, voter enthusiasm for Republicans in Maryland stopped with Hogan on Election Day. In the Senate, Democrats blocked the GOP's "Drive for Five," which was an effort to pick up five seats to bring Democrats under the 29 votes they need to override a veto. In the House, Democrats padded their supermajority by about a half dozen seats. Sen. J.B. Jennings, the Senate minority leader, said the "Drive for Five" was "always a dream," and Republicans still managed to gain some ground. "In the Senate, we picked up a seat in not-a very-good climate, and I think that does say a lot for our efforts and our candidates," Jennings said. But in addition to losing seats in the House, three Republicans also lost county executive races, including two incumbents. Maryland voters didn't hold back in expressing their frustration with Trump and how their anger influenced their votes. Peter Stone, an independent who voted in Annapolis on Tuesday, said he voted for Democrats in protest of the president, though he made an exception for Hogan. "All the way down — down to the register of wills," Stone said, after noting his exception for Hogan. "In my mind, the Republican Party should be basically hung out to dry." A majority of voters in Maryland said the country is headed in the wrong direction, according to a wide-ranging survey of the American electorate. AP VoteCast found a majority of voters in Maryland had negative views of Trump: 6 in 10 said they disapprove of how he is handling his job as president, while a third said they approve of Trump. House Speaker Michael Busch said Trump was clearly on voters' minds. "I think that people came out to vote against Donald Trump and the type of character he has displayed as president of the United States, so it's no doubt that he had an effect on the election, but you still have to have good candidates," Busch, a Democrat, said Wednesday. "You have to have good organization. You have to have the resources to do it, and we raised quite a bit of money to make sure that we funded the races we needed to." Senate President Thomas V. Mike Miller said while Maryland voters like Hogan, they understand that Democrats are the ones who are doing the work in Annapolis. "They know who does what, and as a consequence they rewarded the people that had been responsive to their problems and needs, which was the legislature," Miller, a Democrat, told reporters. Democrats also maintained their 7-1 advantage in the U.S. House of Representatives. Democrat David Trone won the 6th congressional district, the only open seat due to the departure of Rep. John Delaney, who is running for president. Gubernatorial candidate Ben Jealous and Gov. Larry Hogan offer competing visions for Maryland. Jealous has a progressive vision and aims to pass universal Medicare and free college tuition legislation. Incumbent Larry Hogan says Maryland has seen improvement under his administration and new programs could bust the state's budget. News4's Chris Gordon spoke to both candidates about their visions. U.S. Sen. Ben Cardin, a Democrat, cruised to win a third term. A group of Democratic lawmakers gathered Tuesday in Baltimore's Port Covington to talk about their agenda over a working lunch and publicly commit themselves to working across party lines. Cardin was among a congressional delegation congratulating the Republican governor and pledged to work closely with his administration. "He had high popularity numbers, so I think the voters expressed their preference for governor of Maryland and we recognize that," Cardin said when asked what he believed voters were saying by emphatically returning Hogan to the governor's mansion. "And I think it is important now that all of us show that we can work together for the people of our state."